This was one of the tins I pined for before going to New York - I could have wept when I saw it in Williams Sonoma. The Nordic Ware Vaulted Dome tin is a thing of beauty (don't worry - it'll be available here soon). Although it's quite decorative, I thought it was crying out for some simple decoration, so I took inspiration from the lady sat next to me on our flight to New York. She was returning from a trip to see her friend who was at University in Ireland, and was making the trip back to San Diego from Shannon via Manchester, and then from New York - on her own. She told me that she was horrifically hungover and felt so dehydrated she might die. When she ordered a 'cran-apple' I was like... a what now?! Yes, the tangy yet sweet mix of cranberries and apples is rather popular over the Pond. 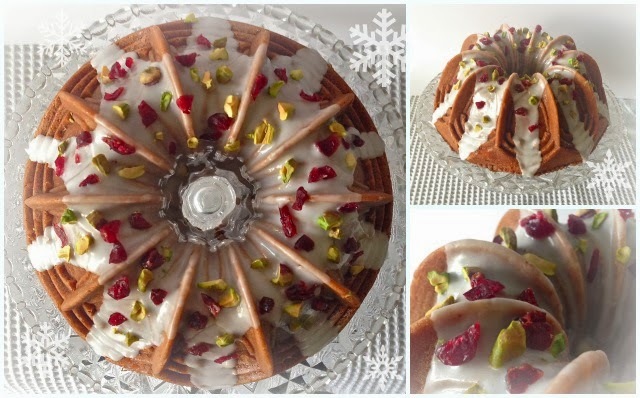 And then it was born... the idea that turned out to be a rather festive spiced cran-apple bundt, baked in a tin from the Big Apple. Perfect. Grease and flour a regular sized bundt tin - 2.4l, 10 cup, 10 inch. Pour the yogurt into a jug. Sift in a third of the flour mix followed by half the yogurt. Repeat this until everything is combined. Don't over mix or it'll be like that old lump of coal in naughty kids' stockings. Stir the diced apple into the mix. TIP: Coating the apple with cinnamon helps it to sit nicely in the mixture, preventing sinking. Pour 3/4 of the mix into the prepared tin. Smear over a layer of cranberry sauce, avoiding the edges. Cover with the remaining mix. Leave the cake to cool for 10 minutes, then remove from the tin. Mix the icing sugar with a little water until it's a runny consistency. Tip it over the cake and immediately cover with your chopped pistachios and cranberries. Oh my goodness, that looks beautiful! So festive and perfect for the time of year. And as for the tin.......I might have to rewrite my letter to Santa Claus.......,I'll accept an IOU until they are available over here. What a gorgeous cake! Love the flavour combo and yes I love that tin too! Great recipe!